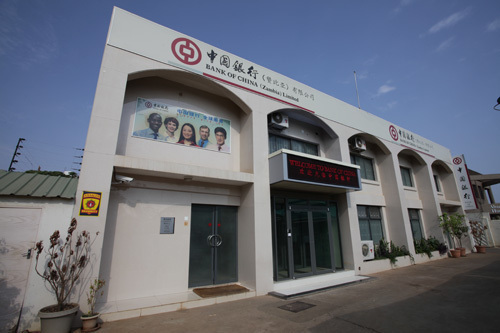 (Bloomberg Businessweek) — The first billboard that greets passengers arriving at the airport in Lusaka, before Pepsi’s “Welcome to Zambia,” is an advertisement for Bank of China. Nearby, a Chinese company is building a sleek terminal. On the road into the capital city, near the office of Chinese telecom company ZTE Corp., another billboard features surveillance cameras made by Hangzhou Hikvision Digital Technology Co. At the national data center built by Huawei Technologies Co., a Chinese man in a bright orange vest walks toward a building that houses government servers. This southern African nation, a former British colony rich in copper and cobalt, is spending $1 billion on Chinese-made telecommunications, broadcasting, and surveillance technology. It’s all part of China’s “Digital Silk Road,” a subset of its “Belt and Road” initiative that contributes an estimated $79 billion in projects around the world, according to RWR Advisory Group, a Washington consulting firm that tracks Chinese investment. That funding has boosted development in Zambia and many other countries, but it comes at a price. Most of the digital infrastructure projects in Zambia, like the more visible airport terminals and highways, are being built and financed by China, putting the country at what the International Monetary Fund calls a high risk of debt distress. It’s also given rise to fears that what has long been a thriving and stable multiparty democracy is veering toward a Chinese model of repression. Zambian government officials defend their reliance on Chinese technology and deny it’s being used for political purposes. “The government has the responsibility to invest in infrastructure,” says Dora Siliya, the information minister. “Zambia’s model for development is neither the West’s nor China’s but an attempt to take the best from both. We have a Zambia model.” The Chinese Embassy in Lusaka didn’t respond to requests for an interview. What’s playing out in Zambia is part of a larger contest between the U.S. and China for dominance over the future of technology and global influence. Companies from both countries sell tech products around the world, but Chinese businesses are offering a wide range of gear and relatively cheap financing in countries from Zimbabwe to Vietnam. They have an advantage in developing nations such as Zambia, which are looking to modernize their technology infrastructure. The rivalry risks dividing the world with a digital iron curtain. The potential for bifurcation is already noticeable, as U.S. allies including Australia and New Zealand have banned Huawei and ZTE from providing equipment for 5G wireless technology on national security grounds and Canada arrested Huawei Chief Financial Officer Meng Wanzhou in December on allegations she defrauded banks to violate Iranian sanctions. Huawei and ZTE are both private companies and have pushed back against allegations that they’re pawns of the Chinese government. Discussions with government officials in Lusaka often begin with a history lesson. First comes the what-did-the-West-ever-do-besides-exploit-us part, followed by a version of the China-has-always-been-our-friend speech. It’s a convenient way to defend the growing reliance on Chinese projects that’s raised Zambia’s debt to that country to $3.1 billion, about one-third of its total foreign debt, according to government estimates. The 44-year-old minister has invoked the “China way” of dealing with the internet when threatening to ban Google and Facebook, which has provided a platform for disinformation campaigns in Myanmar and other countries. He’s called “fake news” a threat to national security and urged self-censorship, saying the government has the ability to monitor all digital devices in the country. A draft cyberlaw scheduled for debate in the National Assembly this year would create an agency with the power to determine whether information published online threatens national security, punishable by jail time, something free-press advocates say could be applied to news organizations that expose corruption. Criticizing President Edgar Lungu in social media posts has already landed several people in prison on charges of defamation. In 2013 and 2014 the government blocked at least four websites by using a technique typically associated with censorship in China, according to the Open Observatory of Network Interference, a global network that collects data on internet tampering. It couldn’t prove Chinese equipment was involved, but its report cited information that Zambia had installed internet monitoring and blocking equipment from ZTE and Huawei. State-run Zambia Telecommunications Co. and its regulator declined to answer questions. A Huawei spokesman in Lusaka says he’s unaware of the company’s technology being used for such purposes. Zambian Watchdog, which focuses on corruption, was one of the websites blocked. Today, its posts are regularly called “fake news” by government officials. Representatives of the group didn’t respond to requests for comment. But editors of the Mast, a newspaper often critical of the government, were willing to talk about the climate of fear engendered by new technologies. “Being a newspaper, if you’re going to call a source, it means they know who you’re calling,” says editor Larry Moonze, sitting at a conference table in one bedroom of the two-bedroom house where the newspaper is produced. “Media institutions are working under fear of the government, with the help of the Chinese,” adds Chief Executive Officer Likezo Kayongo, whose brother founded a predecessor publication that was raided and shut down in 2016. ZTE is also installing cameras in public spaces in Lusaka as part of a $210 million “Safe City” project. The contract was canceled in 2013, over irregularities in how it was awarded, then reinstated in 2015, government officials confirm. The project is designed to increase policing power in a city that’s already one of the safest in southern Africa. Similar debates are going on across Africa and other continents as Chinese digital infrastructure spreads its roots. In neighboring Zimbabwe, where Hikvision surveillance cameras are being installed in the capital, Guangzhou-based CloudWalk Technology Co. won a contract last year for Africa’s first artificial intelligence project. It stalled when the government asked for a discount after learning that facial data would be transmitted to China to help the company perfect its technology, says Shingi Magada, a China-based Zimbabwean consultant who helped broker the deal. “We were just giving away our data,” he says. Hikvision has come in with a competing offer, and the Zimbabwean government is keen to go ahead at the right price, he adds. Neither Hikvision nor CloudWalk responded to requests for comment. Concerns that Chinese technology could be used for spying flared last year when Le Monde reported that data had been transmitted from the African Union’s headquarters in Addis Ababa, Ethiopia, to China nightly for years. The $200 million building was built by a Chinese company with Chinese funding. China dismissed the allegations. The organization, after accusing China of spying, backtracked. In Vietnam, hackers took over screens and audio communications in the country’s two major airports in 2016 to broadcast propaganda supporting China’s claims in the South China Sea. The incident caused an alarmed Vietnamese government to warn its agencies and companies to reduce their reliance on Chinese equipment, which was believed to have played a role. Potential threats to national security like these have prompted the U.S., Australia, and Japan to take countermeasures against the spread of Chinese technology. The three have opposed plans by Huawei to lay submarine cable connecting Australia to Papua New Guinea and the Solomon Islands in the South Pacific. But a Huawei cable project within Papua New Guinea is going forward despite efforts by Western governments to supplant it. The U.S. recently moved to inject $60 billion into the Overseas Private Investment Corp. to increase funding for projects in the developing world to counter China’s spending. And on Dec. 13, U.S. national security adviser John Bolton announced a new strategy for Africa to fund infrastructure projects, saying that Chinese influence has put the continent at risk. The U.S. is the largest donor to Africa, but most of its money goes toward health, agriculture, and clean-water projects. Bolton said the U.S. will try to ramp up funding for other projects. He cited Zambia as being particularly at risk.